Investigations on pitch from Austrian black pines (Pinus nigra var. austriaca) have been carried out to date in the context of the historical utilization of wood and recovery of ingredients for different applications and production processes. The objective of the project was to investigate the influence of environmental conditions such as habitat and season, on the composition of pitch from Pinus nigra var. austriaca and to reveal the impact of pitch tapping on several selected wood characteristics. 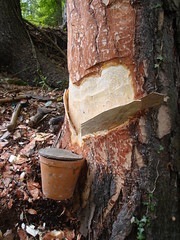 For this purpose both tapped and not tapped pines were investigated in order to demonstrate the influence of former pine tapping in this area on different wood properties. For an overall characterisation of pitch and wood FT-IR spectroscopy and thermal analysis were used. Within the scope of the project the resistance against degradation by means of co-composting was determined as well as related parameters such as density, wettability and the content of extractable ingredients. These investigations were carried out with pitch containing and pitch free (after extraction) wood samples. Several sites in the area of the forestry administration “Klein Mariazell“ (district Baden, Wienerwald) had been selected for sampling due to the permission to collect the required pitch and wood samples. Additional data of measurements on red (Pinus sylvestris) and black pines (Pinus nigra var. austriaca) originating from these sites and plant ecological investigations of the area were available. A student of the AHS Maria Regina interested in the so called “Vorwissenschaftliche Arbeit” was integrated in the research project and had the opportunity to perform her scientific work. Depending on the focus of interest different topics were available e.g. “Historical utilization of wood in the Wienerwald region (wood, pitch, charcoal)“ or „Description of the habitat of Pinus nigra var. austriaca “. Support was provided by BOKU-students who were briefed on educational and didactic know-how by means of the lecture „Wissenschaftlicher Dialog mit Schüler/innen“, established within the scope of the project.